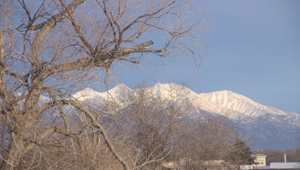 This page looks at typical Alamosa trees listed by common names in alphabetical order. 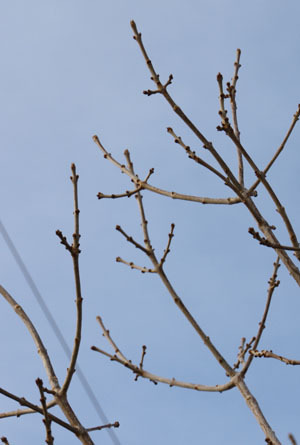 Some trees have more winter identifying characteristics than others. Please let me know if you have more information. All photos were taken in Alamosa, January 2012 by Marilyn Loser unless otherwise noted. 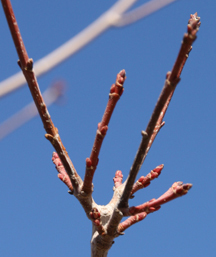 Lateral bud: buds on each side of a branch. Leaf scar: Scar of the leaf attachment. When the leaf drops, a scar is left just under the bud. Lenticels: openings found in bark that allow gas exchange between the atmosphere and the inner tissues of a plant. 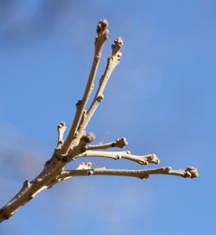 Opposite twig: bud and leaf structure: Buds grow opposite from one another along twig. Pith: soft, spongy tissue inside stem. 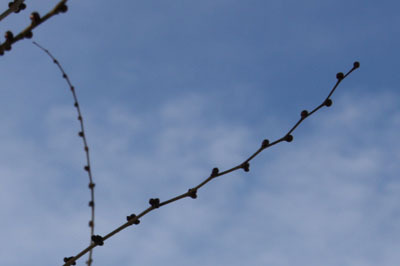 Terminal bud: bud on the tip of every twig. Often larger than the lateral buds. 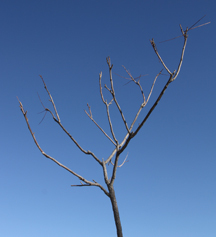 -Twigs often stout and never reddishBark is smooth grey or a pale grey-brown in young trees. 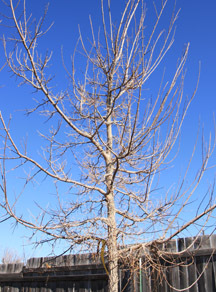 Left: Ash-note opposite branching structure & longer, pointy terminal buds. 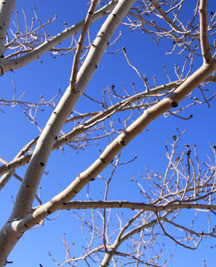 Middle Top: Fuzzy Aspen buds. -Leaf scars meet in the middle of twig. 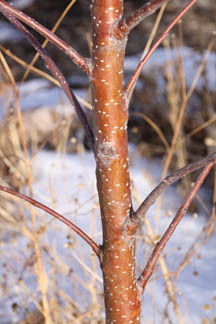 -Mature bark often has noticeable yellowish tinge compared to other trees. -Often have 2 varieties of twigs. New twigs from last growing season are hairy, while older ones not. -Buds typically reddish and hairy. -Very hybridized so fruit size variable. 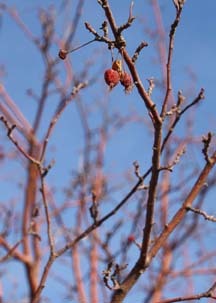 Often smaller-fleshed fruit clings to tree and looks like shriveled cherries. 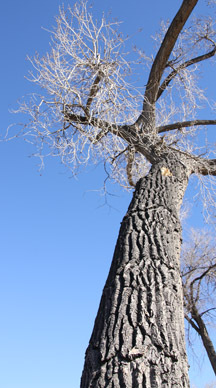 Left: Cottonwood: Brown, deeply furrowed bark of mature tree. Crabapple: Reddish stems and buds (these aren't hairy). Small apples still cling to stem. -Bark acts like cork when pressed with finger nail (bounces back). 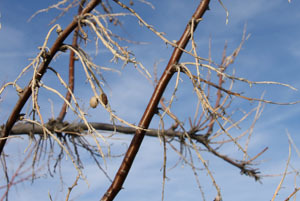 -On Siberian flower buds are nearly spherical. 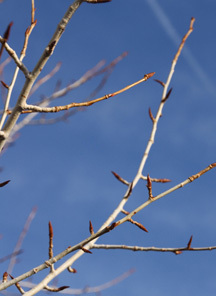 -On Siberian leaf buds are small, round and very dark. -Buds are off center over the leaf scar. 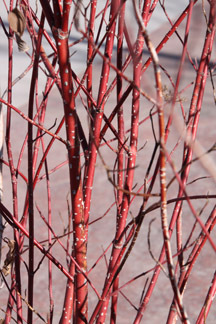 Left: Red-osier Dogwood (shrub in Alamosa) -- shows white, raised lenticels on red stems. Right: Hackberry -- note dense twigging structure near main trunk. 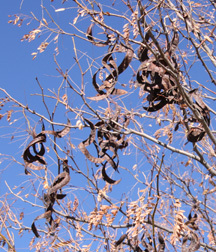 -Seed pods spiral – may still be attached. 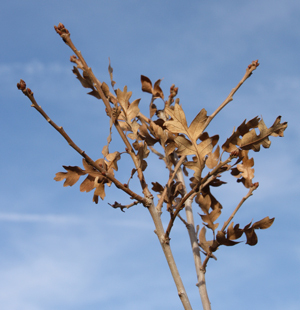 -There are thorn-less varieties that are commonly planted in cities. 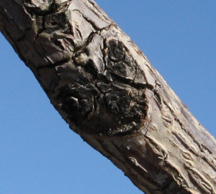 -Bark is usually unique, being somewhat slatey-gray and peeling to one side on mature trees. 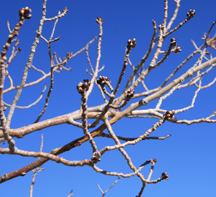 -Looks dead in winter due to tiny buds, thick twigs and sparse branching. Center: Kentucky Coffee in its dead-looking winter mode. Right: Kentucky Coffee -- tilt your head left to see heart-shaped leaf scar.